Quick overview Marcel Duchamp is one of the most important cultural figures of modern times. Drawing on the artist's correspondence and interviews, this title details Duchamp's life-long belief in chance and coincidence, and how that led him to let his life take its own course, constantly travelling, meeting new people and embracing new experiences. 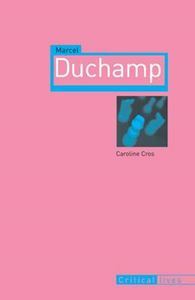 "Marcel Duchamp", by Paris-based curator and art critic Caroline Cros, is a new account of one of the most important cultural figures of modern times. Drawing on the artist's correspondence and interviews, she details Duchamp's life-long belief in chance and coincidence, and how that led him to let his life take its own course, constantly travelling, meeting new people and embracing new experiences. The author shows how Duchamp's lifestyle never allowed him to follow a conventional artistic career, and also how the artist's constant search for the random in life is strongly echoed in the art that he created. The book explores work such as the 'Readymades', the Grand Verre and Etant-Donnes, explaining the creative processes behind them, the way they have been interpreted and sometimes misunderstood by his friends and the public, and also how some artists such as Rauschenberg and Jasper Johns immediately understood the importance of the work. Just as significantly, the book examines Duchamp's life after he stopped making art, which was remarkably early considering his reputation. Cros describes how he became involved in a wide range of activities, including historical exhibitions, chess games, museums, foundations, salons, and publications, and in friendships and correspondence with the most influential artists, critics, collectors, and writers of his time. After 1915 Duchamp divided his time between Paris and New York, and this allowed him to establish strong relationships and become widely known in the USA. As a consequence he played an important role in the evolution of American art. Thematic as well as chronological, this original and concise critical study will interest the wide general audience for Duchamp, as well as scholars and specialists in the field.